The Maya had two varieties of Canis familiaris, the xoloitzcuintli, otherwise known as a Mexican Hair-less, and the tlalchichi (techichi in Mayan), a smaller, hirsute variety introduced into Maya culture by the Toltecs. Together, they were both known as pek, or dog. The xolo is medium sized animal (35-45 pounds) with smooth slate or reddish-gray skin that often has white spots or blotches. Not all of the dogs are born hairless; they are heterozygous, with one recessive gene for a normal coat, and one dominate gene for hairlessness. A mating of two xolos generally results in a litter consisting of 25% of the puppies with hair, 50% hairless puppies, and 25% stillborn (the fate of the ones with two recessive genes). These larger xolos were used as hunting and guard dogs by the Maya. The smaller Techici had another use. The 17th century writer Joannes Jonstonus reported the Indians of Cozumel ate Techichi like the Europeans ate rabbit. He also stated that those raised for this end were castrated, so they would fatten up better. Bishop Landa reported they were fed corn, often in the form of tortillas, and the Maya considered the meat quite tasty. 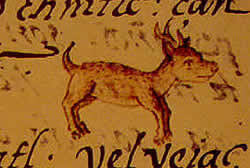 The archaeological excavations at San Gervasio turned up many fire-baked dog bones, indicating that this was, indeed, the end result of many of these domesticated canids, who were usually eaten when they were around one year old. Dogs were also offered as sacrifices to the gods. Classic period graffiti in Tikal shows a dog marching in a procession on its way to the sacrificial altar. Bishop Landa tells that dogs were often sacrificed to the goddess Ixchel on Cozumel, and describes one such sacrifice. The heart of the animal was removed and burned, and the blood used to anoint the idol. The animal was then cooked and eaten. 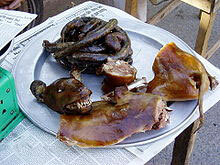 The usual recipe for sacrificial-dog-stew was to slow cook the meat in an olla of water, chili peppers, and corn. The long-bones were removed from the stew and cracked open to remove the marrow as dessert. Serves 12.